Great product at a great price no complaints here awesome deal. I would highly recommend to everyone who see it to buy it if they want quality. Create an instant playground with this charming airplane teeter-totter. Safety and durability are forefront with a heavy base, sturdy motion platform, and three adjustable height settings that control the amount of motion. With room for up to seven children and a realistic spinning propeller, this outdoor teeter-totter lets imagination take flight. I own an indoor playground where this airplane teeter totter is the most played with toy. Everyone loves it. My children (2,5,and 8 years) all play with it. They have spent many hours pretending on this airplane. It is very sturdy and handles 7 children at a time on it with no problem. One word of warning though...assembly took a long time (I think it was about 3 hours of tedious work.). Even with the assembly, this is definitely worth it. WE love the Lifetime Ace Flyer Airplane. My daughter(who is 18) and I tried it out after we put it together! It is very sturdy! My grandkids love it and fight over who gets to "fly it" We did order the multi colored one but received the earth tone plane. I wasn't very happy with that part but over all love the plane/teeter totter. It is time consuming to put it together so plan on some extra 3-4 hours to complete this plane with two people. It wasn't hard. instructions are easy to follow. The teeter-totter was a perfect fit for our yard. The grand children like to pretend to be the pilot and like to try to be brave out on the wings(the actual tetter-totter). The color is bright and inviting and looks to endure a lot of weather. We ordered this teeter-totter for our backyard so that we could avoid the congested parks. My husband was able to assemble this by himself but did admit this is a two-man job. As for the product itself it is very sturdy and durable. The color did lighten a bit over time with high sun exposure but that's to be expected. Great product, would definitely recommend to parents of young children! This toy is great for children of all ages. It is designed a little different from a regular see saw. So it does not go as high off of the ground as a playground version. Smaller children will get enjoyment out of the middle seats. Older children will enjoy the wings and the tail seat. The kids love this teeter-totter! We are simply delighted with this product. It was pretty easy to assemble. The directions were very clear and easily understood. The plane is very durable and exceeded our expectations. A good value. The kids have loads of fun imagining flying to other places and changing seats often! It's still fun for one or two kids playing because the plane rocks easily side to side if just sitting in the body of the plane. The propeller rotates with the steering wheel. Hi I purchased this item for my daycare center. The kids love it. It is adjustable for different age groups and sizes. Took about 2 hrs to put together. Not really difficult. What I like about it is my entire group can ride at one time. You don't have to worry about the 2 year olds falling. You can seat them in the middle. You will need about a 8 ft. X 8 ft. Space to operate the airplane efficiently. Its been raining alot since I purchase it and I have seen no rust spots. Good investment for a cheap price. 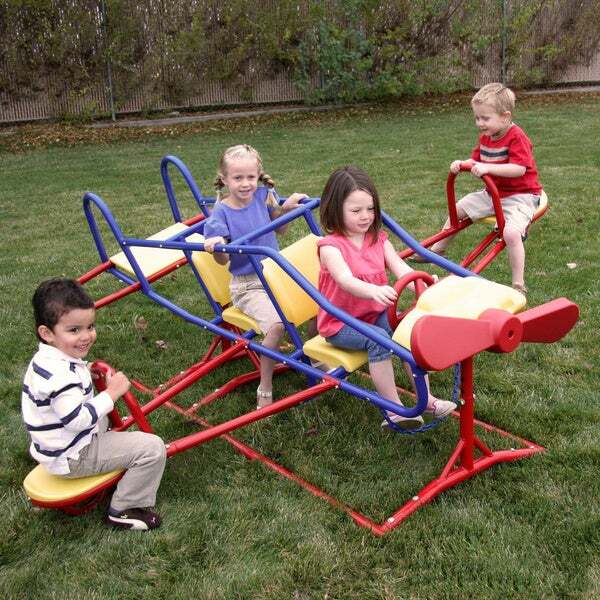 I order this multi color airplane for my playground at my childcare facility and all the children just loves it so much til i really have to time each child on it because every child wants to get on it. A fabulous toy for kids but definitely a beast to assemble. However, grandpa and dad said they would put it together again for all the fun the kids are having! My grandkids have enjoyed this toy tremendously. It’s different then the other toys around consequently it gathers their attention and promotes well-controlled play. One of the best outdoor playsets I have bought for my little ones. They have so much fun playing with their friends that makes me wonder how come they do not get bored, as they do with almost everything we get them. This one makes a difference. The kids love it but wish it went up a little higher on the sides. My kids love this toy. It was a great Chistmas gift for my 3 boys. They can't break it or lose pieces. It feels sturdy but isn't too hard for two people to move a short distance. You can a whole lot of grandkids on this!!! There has been hours and hours of fun on this. Very well made, sturdy, and the kids love it!!! Extremely great quality outdoor playset. We purchased this 8 years ago and used outdoors in the Florida heat/sun for all those years and it looked almost as good as when we bought it. Nothing came apart or was loose and the paint looked still fresh. The only thing that slightly faded was the propeller but still looked good enough to pass on to my nephew many years later for him to enjoy for years. My Grandchildren love this. Well made. Yes it takes a little time to put together but my husband did it in about 3 hours. Product was very durable and kids enjoy playing on it. His is one of the best purchases I’ve made for my kids. We live in the city with a smaller backyard and didn’t want a giant jungle gym. The price was reasonable for the quality of the product. We have had it for 4 years and it still looks brand new! When we have visitors, their children are always drawn to the airplane. kids love it ! made great ! This was a bit of a job for the guys to put together but it was so worth it! 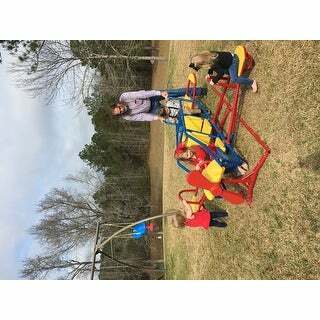 The grandkids (6, 4, 2 and 20 months) absolutely love playing on it. There are four of them (so far!) and there is a place for everyone. The captain’s seat seems to be everyone’s favorite and they love turning the steering wheel. It takes two people to pick it up and move it for mowing but one person can drag it if needed. This was a great addition to the grandkids’ playground at our house! "What age range can play on it"
"Does it meet safety requirements of ASTM F1487?" "I think your add confuses people. Lifetime warranty to me means the product is covered for lifetime??" This comes with a 1 year limited manufacturer warranty. Lifetime is the name of the manufacturer. "The earth tone is not showing as an option. Are they out of stock? Will they be back in stock, and if so, when?" The earthtone option is currently not in stock.We do not have a restock date set. "Does the center cockpit actually move & Tetter Totter ?" Yes if you wiggle enough it will move the tetter totter. "Is this recommended for indoor use? If so, what are the reccomendations for indoor use?" Hello Debra, this item is designed for outdoor use. However, if you have the space for indoor usage it shouldn't be a problem. Thank you for shopping with us. The reviews were really good.Both Grandsons love planes and needed to get them a gift for their new house/yard and thought that they would love this. I think it is very neat, and my son will love it!